This article is an ethnographic study of the spatial aspects of the everyday life of neighborhood police officers, based on participant observation conducted in Kazan&apos; in 2007. It analyzes forms of neighborhood policemen’s professional activities and four types of professional spaces where their work takes place: (1) the precinct—the primary (often spatially disordered) area of the officer’s supervision and the space for basic practices of self-presentation to the controlled population; (2) the neighborhood in general and, in particular, the space of the precinct station where officers’ primary professional solidarity is formed and where, as a rule, structured interactions with the local population happen; (3) the space of the district police department, which usually appears to the “ordinary” neighborhood police officer as “the bosses’ territory” and therefore as “other” and “hostile” space; (4) the citywide space beyond the precinct, where professional duties are often perceived negatively and treated as a violation of policemen’s labor rights. In Russian, extensive summary in English. Khodzhaeva, Ekaterina. 2012. “Private and Public in the Spatial Organization of Everyday Practices of Neighborhood Police Officers (An Attempt at an Ethnographic Study)”. 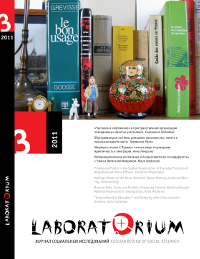 Laboratorium: Russian Review of Social Research 3 (3), 18-52. http://www.soclabo.org/index.php/laboratorium/article/view/264.